BACKTOFRANKBLACK.COM: MORGAN AND WONG WEEK: DAY 3 - SPACE: ABOVE AND BEYOND, OVERVIEW AND COMPETITION! MORGAN AND WONG WEEK: DAY 3 - SPACE: ABOVE AND BEYOND, OVERVIEW AND COMPETITION! It's Wednesday and we're back for day 3 of Morgan & Wong week. We've looked at Millennium (which we will be returning to tomorrow), we've looked at The X-Files - so what's next? Well indulge me please as I ramble on a little about the show which to me, was more Morgan & Wong than them all: Space Above and Beyond. If you take the time to listen to our Glen Morgan interview this coming Sunday, you'll no doubt be utterly unsurprised at the levels of personal affection he has for this show. This was Glen and James' baby - written, produced and conceived by the duo. It was quite a wonderful series that flew high, only to be shot down on its maiden season by the network. 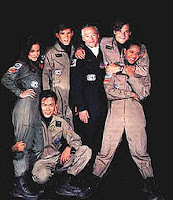 Space: Above and Beyond came to air in 1995. It lasted 24 episodes and was nominated for both Emmy and Saturn awards. The story carried echos of many war tales and seemingly a small homage of Heinlein's Starship Troopers. The year is 2063. The world is at war, a space war with an enemy known as the "Chigs". Suffering severe losses against this alien foe, humanity grows more and more desperate to hold the line and their forces fill with untried, inexperienced and untrained units... Space: Above and Beyond tells the story of one of those units. In particular the show's heroes belong to the 58th "Wildcards" unit. and we follow the adventures of this group as they bond and grow from fresh meat to veterans in the field of War. From the synopsis it should immediately become apparent what an ambitious project this was. Not just a future tale, but a bleak, epic future tale. 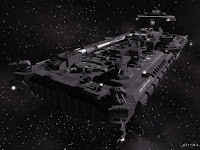 Even with CGI helping cut costs on what inevitably would be a high special effects budget, it was clear the studio would be watching this project closely for any signs of weakness..
Like so many shows with unique potential, Space: Above and Beyond was a concept that inevitably faced enemies far mightier than the Chigs. To start, this future is bleak and colourless. There is no utopia of Star Trek, or even the snug comfort of a commercial space station like Babylon 5. Space: Above and Beyond put you in the seat of the trooper - you aren't Captain Kirk or Captain Sheridan; a leader whose decisions could bring victory - or even the hope of victory. You are a grunt. You are one of the expendables wondering if your next mission would leave you drifting cold in space or dead on some forgotten planet. Space: Above and Beyond was a dark show. Furthermore, the show wasn't set too far into our future, less than a 100 years. This creates three further obstacles for a show to gather a sizeable audience. First, stories set in the far future can be wonderous fantasy worlds filled with teleporters, silver cities, crazy aliens and lots of glitter - if we are to invest in a "near future" storyline, there has to be roots in what we experience or conceive to be contemporary - so it becomes less escapist. Secondly, rooting it in the near future makes the events more intimate than the far future; we empathise with the plight against the alien Shadows in Babylon 5 - we see the parallels to our military wars, but it's more conceptual and removed. "Near future" wars look for close parallels - and those who look to do it realistically like Space: Above and Beyond will attempt to draw intimate parallels with our contemporary understandings of war. As intended, this can again make an audience uncomfortable - it's the future, but it's the near future. It COULD happen to you - and the vision reflects that. Third, when something is meant to feel near the age we live in, we tend to be more critical. We expect a certain truth that far future can side-step. Audiences can be highly critical as how believably "near" a "near future" can be. But this isn't a criticism, it's something to applaud, as any drama worth its salt will create some form of response, and the sheer overwhelming struggle of a seemingly impossible war is a treasure trove of drama. Morgan and Wong did indeed take the show Beyond - beyond what many would dare try, and while the show didn't have length, there is no doubt it had quality. Before I go any further, I have to say it's been a long time since I've seen Space: Above and Beyond - too long in fact. I've been waiting for a decent content filled DVD boxset (as has Glen!) for a while and I'm feeling I'll have to capitulate to the current Region 1 release (pretty barebones). So in a way, this overview is more about the memories - the lasting impact of the show, than the detail. Space: Above and Beyond was a show I was initially sceptical about. By the mid nineties we couch potatoes were in a very conflicted situation; we were coming out of the 80's trend of pretty, young, dashing heroes finding them to difficult to relate to, but still an audience demanding pretty, young, dashing heroes to grace our screens. I was no exception to this shallow rule, and seeing a cast line up, my gut was "uh oh, pretty boy show" - which it was, so far as the cast were far from unattractive; Weisser, Cloke, Rowland - and even the mature unflappable dignity of James Morrison - gave me the feeling of a too pretty cast in a very unpretty world. But once I got into that world, I learned the folly of such presumptions, and perhaps in such a dark world you needed some aesthetics that gave you comfort. It did matter what the characters looked like, what carried you through was the circumstance and while the characters lived in hope, as a viewer, the oppressive threat of the enemy drove home the bleak futility of a soldier's war. The Chigs felt unstoppable, but as a pilot or a trooper, you just had to fight on regardless and hope for the best. Whenever I think back to Space: Above and Beyond that feeling is what I always remember - a feeling of uncertainty - not just whether the war could be won, but whether the next day would be the day it was all over... the day humanity ended. For me, Space Above and Beyond was a show that fought to string together many dark layers rather than fixating on the obvious one. It sought to texture its universe with more than guns and dogfights; to really make you believe it isn't just about the common enemy, but about a wealth of forces that weave around the battle with the enemy. Space: Above and Beyond had conflicts within the genetic underclass (the in viteros and the silicates), conspiracies within their own military and governments, and deep frustrated personal struggles between the unit. What impressed me was the frailty it added to the human soldier. I remember one of the lead character's, Wong, actually breaks in the face of capture - which in most shows is considered reprehensible and disgraceful, but in Space: Above and Beyond, you are encouraged to feel what could make a good man fail his friends, his country and himself. I remember that moment profoundly. 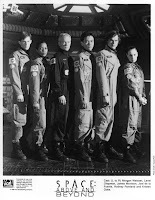 I recall wondering at the time (unaware the show was cancelled) what potential Space: Above and Beyond had if it was willing to sacrifice the usual good guys/bad guys approach to war that most shows enjoyed. For me, the show's peak - in fact one of the best stories I've seen in TV sci-fi - was a tale called "Who Monitors the Birds?". The episode had the in vitero Hawke stranded alone and injured on a hostile planet. It's a powerful episode replete with physical struggle and personal demons, that relies as much on what's not said than what is. The boxset is worth picking up for that one tale. It certainly showed me the potential in the show's future, a future it sadly never got to play out. For me Space: Above and Beyond was a show that was looking to slowly grow into its own shoes, and hoped the viewers would enjoy experiencing that growth - unfortunately I think many viewers either expected something more immediate or were hoping for something else all together. Perhaps it was born before its time. Battlestar Galactica managed to complete its four season trek carrying with it a very dark world, filled with tragedy, gloom and only the faint whispers of hope - a little like Space: Above and Beyond. Sadly, we'll never know - we are left with our memories, our DVD box-set and the knowledge that while it was not on the air long, it was on long enough to be remembered. And if this article helps jog that memory and sustain it even further, then I think Day 3 of Morgan and Wong week has done its job. To celebrate Morgan and Wong's proud achievements, we are offering the FULL series of Space: Above and Beyond on REGION1 DVD to a lucky winner! Simply send us an email with your name and address to info@backtofrankblack.com and we'll draw a lucky winner on Sunday. Unlike the war against the Chigs, this is an easy win! 7 Responses to "MORGAN AND WONG WEEK: DAY 3 - SPACE: ABOVE AND BEYOND, OVERVIEW AND COMPETITION!" God, did I love this show. It took a little while to find its feet, but when it started stinging together episodes like Hostile Visit and Choice or Chance, Never No More and Angriest Angel, Toy Soldiers and Dear Earth, not to mention the way the series ended, from Stardust to Sugar Dirt to the two part finale... That was some absolutely television. I still get chills thinking about that final shot with Nathan in Paul's bunk and Cooper in Shane's. "Semper Fi. Always faithful, my friends." Of course, I'd love a feature and commentary packed DVD set, maybe one where they didn't inadvertently use pictures of Babylon 5 in the menus, but to be honest when the set came out I was happy to have anything! When I was rewatching the series earlier this month I thought about maybe recording my own commentaries and publishing them online as a podcast because the show really deserves that kind of serious discussion. It was doing some very bold and interesting things and doesn't always get the credit for the influence it had. At a certain point in Battlestar Galactica's run it seemed they were quite happy to lift plots wholesale from S:AAB. It was also cool to hear Joss Whedon give props to Who Monitors the Birds in the commentary for a season 5 episode of Angel that Rodney Rowland guest starred in, for doing the no dialog thing well before he did Hush on Buffy. In a lot of ways it feels like episodic television is just catching up to the kind of work Morgan and Wong were known for on the X-File, Millennium and Space: AAB. For that reason I really wish they'd do another series together. It would be so fantastic to have them back on TV, blowing my mind again. I watched it from the start, saw the first episode by accident and I loved it. I loved the use of The Ramones and wished there was more of it. I think this barebones box set is more than we could ever hope for. I waited for the exclusive Walmart or whatever period to run out and bought it very soon after that period. I haven't myself watched a lot of it, the first couple of discs or so. But "I did see Who Watches the Birds?" and while I thought it was a gutsy and experimental it failed to grab me. Kinda reminded me of the film "Soldier" with Kurt Russell where it was a hero who didn't say a lot. I wonder if it had played better if it had been later in the show, but then again, he would have bonded more with his platoon so I guess it made more sense that way. Sorry to say that this show passed me by completely at the time. Interesting post, though, putting me in mind in part of both Battlestar Galactica and Enterprise in its setting and tone, and reminding me that sometimes a show doesn't find longevity through no fault of its own or its creative team. It sounds like Space, Above and Beyond is one such show, but I'm inspired enough to check it out closer. I always remember this show because at the time my Father had cancer and wasn't doing to well, this show came along and took me away from that stress, I totally love this show for so many reasons and" Who Monitors The Birds" should be the entry episode for anyone that wants to discover this amazing series, seriously start with that episode then work your way from episode 1.02, avoid the pilot it has that "filmed in Australia" Matrix2,3, Star Wars Prequel curse and wasn't well done, but the rest of the series is amazing, hasn't dated, has amazing props, special effects and great unknown actors. I watch an episode of this every month or so, have done for the last 10 years, My father is still around and so is SAAB, this show has never left me. SAAB and Millennium for me were the 90's. Can't wait until the interview. Brad - for Glen's opinion on the S:AAB boxset, check out Sunday's podcast. The Chig Diaries is well worth a look too (as Joesf says) fascinating journal from yesteryear! Adam - yes go buy a copy. I think you'll be pleasantly surprised and if you're up for an experiment follow Chris' point and watch Who Monitors the Birds first! There's a Fox mega sale over there that ends 2 March 2010. And the Complete Series Millennium (1-3) box set is only 27 bucks. Now, that's what I call a steal. S:AAB (which has no relation to the brand of car so far as I know) was and always will be one of my favourite shows. Awesome space battles using real space physics years before BSG did it, great characters and not at all afraid to show us all aspects of the cost of war. Another show that should be resurrected! Great tribute to a wonderful show, thanks B2FB.